Perceiving the public prosecution service as the driver of the wheels of justice and one of the mainstays of the rule of law, we are concerned by the proposed constitutional amendments. In our view, they are a step backward compared with the valid constitutional guarantees, a surprising step backward given the expectations based on the judicial depoliticisation requirement in Chapter 23. The proposed constitutional provisions do not only fail to guarantee depoliticisation, but on the contrary, they relocate, concentrate and multiply political influence on public prosecutors. Under the proposed amendments political influence will be relocated from the National Assembly and Government to the State Prosecutorial Council. The reduction of the number of people deciding on the appointments, dismissals and status of public prosecutors and their deputies will result in stronger concentration of political power. The introduction of a mandatory personnel filter – the judicial and prosecutorial training institution – will result in the multiplication of political influence. Our apprehension arises from the fact that the proposed amendments do not include any guarantees of prosecutorial independence from the executive or legislative authorities. The draft provisions significantly undermining the valid constitutional guarantees of prosecutorial non-transferability and the existing guarantees of prosecutorial immunity are also concerning. The guaranteed autonomy of the public prosecutors and their deputies will be eliminated and, according to the draft version, the institute will become autonomous but the individuals holding office will not. 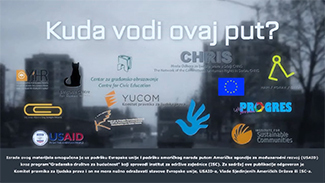 We hereby express our apprehension that the reduction of the number of State Prosecutorial Council members appointed from among the ranks of public prosecutors and the increase in the number of those appointed to the Council by the legislative authorities, coupled with the active involvement of the executive in the Council, will definitely not facilitate the depoliticisation of the public prosecution services. The proposed amendments risk to further undermine the already fragile guarantees of prosecutorial autonomy and result in even greater and stronger political influence on the work of the public prosecution services. 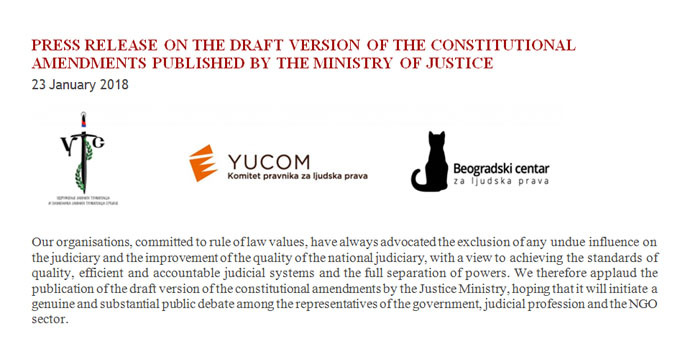 We call on the Justice Ministry to include the draft text of the constitutional law in the agenda of the public debate on the draft version of the constitutional amendments, given that it was precisely the constitutional law that gave rise to unconstitutional reappointment of judges and our experiences with the prior judicial reform, the consequences of which are felt by Serbia’s citizens and the entire judicial system.